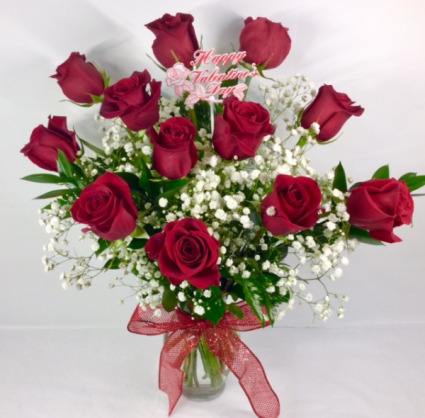 Fragrant flowers are a great way to impress someone you love on Valentine's Day! This fresh arrangement is in a purple glass vase filled with some of nature's most divine smelling flowers! It has stargazer lilies, premium red roses, tall purple liatris, red carnations , rich purple statice and waxflower. It is accented with a satin bow and a glittery heart pick. For the Hydrangea lover!! 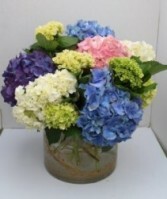 A beautiful arrangement of long lasting mixed colored Hydrangeas in a large glass cylinder. Unforgettable is right! 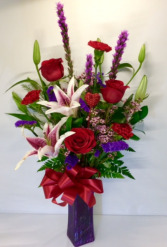 Your loved one will always remember when they received this gorgeous arrangement! 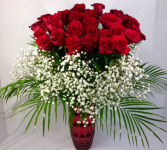 It has 36 premium long stemmed red roses with a halo of airy babies breath and robellini palms around it. Arranged in a mercury glass vase with a geometric pattern.